Before travelling to the George Washington House in Bridgetown, Barbados, I thought what most Americans think about George Washington: he was a strong, moral, and noble leader who is the epitome of what it means to be a patriot and an American. While visiting his former home in Barbados, where he lived for two months in 1751, I realized how important the movement--both voluntary and involuntary--of people to this island shapes the nation’s and region’s history with one of the darkest conceptions of all time. At the George Washington House, many exhibits and tour excerpts discussed how Washington, nineteen years old at the time, moved to Barbados partly to find a more comfortable living environment for his ailing brother. However, Washington was also looking for a way to rise above his modest status in society. Washington had ambitions of belonging to the social elite and used his time in Barbados to network and learn ways in which he could improve his status socially and financially. While the tour was informative and did well to address Washington’s successes and personal character (the quality of which is often praised in history books and popular culture), the tour and museum both failed to address the issue of slavery and its role during Washington’s time in the island. Agriculture was a money-making machine in the eighteenth century, and Washington inherited and maintained arable land in both Barbados and Virginia. The result of this was an increase in social and financial standing, the dream he had been working to fulfill. But he did not accomplish this on his own. Washington’s financial growth, his beautiful plantation house, and his rise as a member of the social elite are all directly linked to the enslaved persons who labored over his fields. And Washington was not alone in this, neither in the Colonies or island nations like Barbados. Hundreds of plantations owners across the new world relied on enslaved labor to produce. As a result, millions of enslaved Africans were bought and sold to be overworked, tortured, and killed. While I was at the George Washington house, I saw a small display about the use of enslaved labor on the plantation. 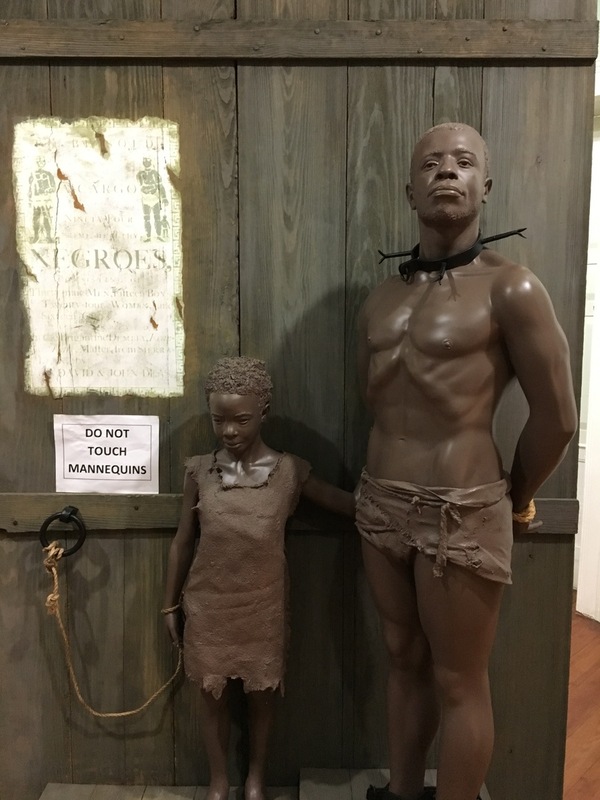 The display’s artifacts consisted mostly of informational readings, but it also had a set of mannequin’s representing an enslaved man and child as well as a display case of chains, shackles, and tools for punishment. By the time I reached this small corner of the exhibit, I had been observing and exploring the property for nearly two hours. This was the first reference I saw that discussed the use of enslaved people on the plantation. Based on other historical records, we know that the plantation economy of the Colonies and Barbados were dependent on slave labor, so I couldn't help but wonder why there was no mention or recognition that this household’s status and legacy is based almost entirely on one of the darkest institutions humanity has ever created.